Everyone in Gusty Gully of a certain age was getting ready for university, that is, everyone except Megan Evans. You see, Megan didn’t get the grades she needed to go to university and even if she had, she didn't have a clue what she wanted to do. So she had three options. She could re-sit her exams, leave school and look for any job or go travelling. The latter, she thought, would give her extra time to think what she wanted to do with her life. The thought of watching her friends leave home without her, was just unthinkable! ‘You should go back to college and sit your exams again,’ said her mother, her father, her grandparents, Phil the fish, Ian the news and most of her friends. It seemed the whole world wanted her to suffer another year at college where all her friends knew what they wanted to do with the rest of their lives. She didn’t know what to do for the rest of the week let alone any longer! Megan looked out of the window and wished she could run away and join the circus, anything would be better than staying in the village without any of her friends. Then she saw the lady from the home for waifs and strays, she was cradling a cat that had just been run over and there was blood everywhere. ‘Can’t stop mum,’ shouted Megan as she ran through the door towards the road. ‘Can I help you?’ she said to the lady carrying the cat. The lady smiled sadly and nodded her head. ‘Yes, but I think he’s broken his leg and he’s in terrible shock. We have to stop the bleeding and keep him warm.’ Megan was glad the lady found the cat so at least it stood a chance. Megan followed the lady to the home for waifs and strays. She opened the arched gate that led into the garden. She had always wondered what it was like inside. Tom the egg said he loved working for them and they were always kind to him. Although, she did remember him saying that the lady was a bit strange but she never asked him why! They walked quickly up a stone path boarded by all sorts of flowers and bushes. Megan saw the pond covered with lily pads and fading white flowers. ‘Did you see who ran it over?’ she asked, spotting a chicken sleeping in the herb garden. Megan followed her into the house. It was cosy and bright, just as she imagined it would be. A table was turned into a makeshift examination area and the cat placed ever so gently upon it. Megan was fascinated. ‘Its leg is broken,’ said the lady and made a quick call to the vet without taking her eyes off the cat. ‘I’ll bring him straight over,’ she said and wrapped the cat in a blanket. ‘Would you like to come with me to the vet?’ she said to Megan. ‘You could hold him on your lap and we’ll look for the owner when we get back.’ Megan nodded nervously. She had never seen a vet before. They soon arrived at the vets. Megan looked around the room where people sat with dogs on leads, cats and even a gecko in baskets. There was something about the place, something she had never felt before but it made her smile. She talked to the people waiting anxiously and smoothed a dog that was old and too tired to look up at her. Then she saw the notice. It was an advert for a trainee veterinary nurse. Her heart beat faster and faster and a great feeling of excitement rushed through her. That was it! That is what she wanted to be! She just knew it! Once in the room with the vet, it was decided the cat needed an operation so would have to stay overnight. The lady agreed to come back the next day. But before they left, Megan asked about the advert. 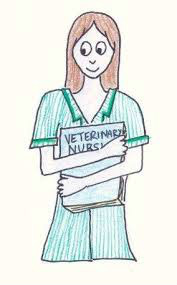 The vet suggested that Megan did some voluntary work to see if she really would like to become an animal nurse. She agreed at once and arranged to go there the next day. A week later, Megan called at the home for waifs and strays. She already knew that the cat had survived his ordeal and although his leg was in plaster, he was back with his owners. But she wanted to tell the lady that if it wasn’t for that day, when the cat got run over, then she might never have known what she wanted to do with her life. And that is what Megan Evans eventually became, a veterinary nurse. And the lady at the home for waifs and strays arranged for her to work with turtles in Greece during the holidays.